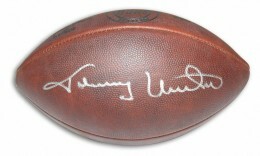 As the face of the early NFL, Johnny Unitas football cards and autographed memorabilia have always been in strong demand. His vintage cards from the Topps sets of the late 1950s and early 1960s are some of the most coveted and valuable cards of the era. His resume defines what it means to be a Hall of Fame player. 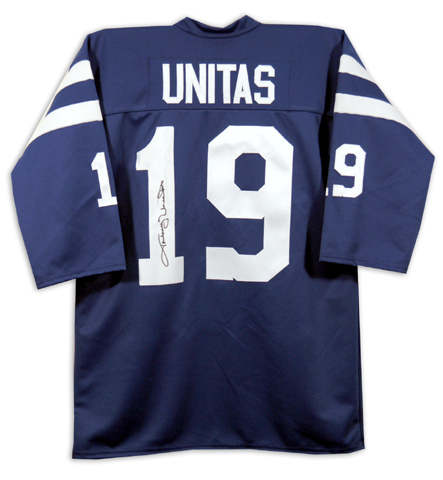 Unitas was a ten-time Pro Bowl participant, four-time league MVP, and three-time NFL Champion. Long considered to be one of the greatest quarterbacks of the NFL, Unitas' success on the field and accessible demeanor off the field helped usher in a new era in sports media. As a result, his fame and popularity has translated to the creation of numerous fans and collectors through the years. 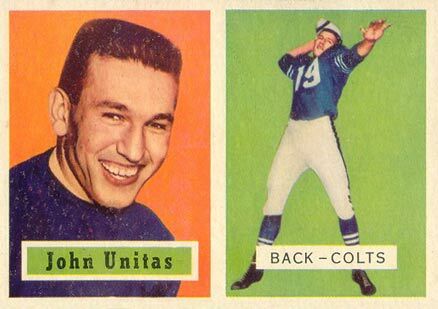 The Johnny Unitas rookie card can be found in 1957 Topps Football. The card was double printed but due to smaller overall print runs of the era, the increased availability in no way has hurt the card's value. The demand is strong demand to offset any supply issues. High grade examples can sell for tens of thousands of dollars. Johnny Unitas' first certified autograph card was part of a food issue set from 1995 Tombstone Pizza and can be difficult to find today. His first mainstream autograph was distributed by Upper Deck as part of the incredibly popular 1997 Upper Deck Legends set. Unitas' first memorabilia cards were released in 2000 by Donruss, Fleer and Upper Deck. He had a total of seven different memorabilia cards made with each of them ranging in serial numbering from 21 to 400. 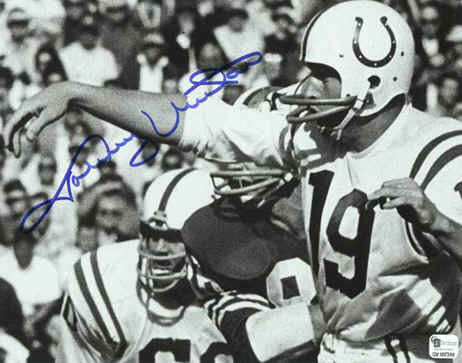 Unitas enjoyed a relatively healthy life after his retirement from football and was able to participate in numerous autograph signing appearances. Strong demand and moderate supply have helped ensure solid values for his autographed items with footballs being the most popular. The 1957 Topps Football card set is one of the most cherished of all-time. The colorful backgrounds and dual photographs combine to form an aesthetically pleasing card. 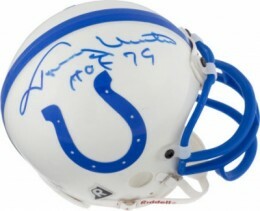 Below you will find examples of what an authentic Johnny Unitas autograph looks like. This can be used as a first point of reference for determining the legitimacy of autograph memorabilia, but is not a substitute for having your items authenticated by a well-respected professional autograph authentication company. Some of the trusted sources within the sports memorabilia market include the following companies: PSA, JSA, Steiner, Tristar and Mounted Memories. Click on any of the images below to view full size photos. A very legible and even-handed signature with clear, crisp handwriting and distinguishable letters. The letter "J" is unique in that while not standard cursive like the rest of the signature it is discernible as a "J" with a short down stroke with a line that extends to the left before forming a small loop that circles back with a flair to cap the letter. The pen lifts to star the "o" which is closed, the "h" is small but legible, the "n"'s are similarly written but implied as compared to being pronounced. The letter "y" is very shallow on the top with a long tail and horizontal finish. The "U" is wide and deep, with the "n" again being more implied, the "i" is not dotted. The "t" forms a crossed "l" shape and the "a" and "s" are written but again very small.